There may be some additional setup to access your machine via SSH remotely. If you’re behind a router, you’ll need to forward an external port to the internal SSH port (default is 22) of your machine. Any firewall will need to be configured to allow the appropriate incoming access. When your machine goes to sleep, it may or may not interfere with SSH access. Turn off sleep or turn on “Wake for network access” (Energy Saver preference pane). …that’s it. If you’re using a Windows computer to connect, you’ll have to download a client. 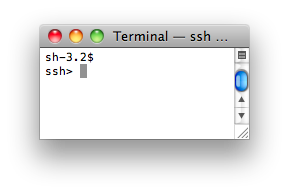 If you want to transfer files securely, you can use the same command above but replace ssh with sftp . Then you’d have command line access to downloading and uploading files. Much easier would be to use an App like CyberDuck, or the popular Transmit for SFTP access. You can continue to use the shell as normal, or not, but if you close it, so too does the “tunnel” you created close. In the example above, port 5900 is the default port for VNC, the screen sharing protocol. You could now enter “vnc://localhost:5901” in the Finder’s Connect to Server dialog on the local computer, and it would attempt to access the remote computer’s VNC server via the encrypted SSH connection. Now every connection Firefox makes is routed through the encrypted tunnel to the remote host. To the outside world (internet) your requests appears to come from the remote computer. Be aware that it takes proper configuration to mask all your activity. You must check on each application’s use of proxies. As well, DNS requests (resolving domain names to IPs) may not be masked by the proxy at all without additional steps.